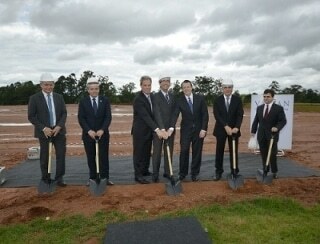 Varian Medical Systems today held a groundbreaking ceremony with government officials, leading cancer clinicians and partners for its new 50,600 square foot manufacturing, service and training facility in Jundiai, Brazil. Located in Multivias Industrial Park, this Varian facility is targeted for completion in the second half of 2017 and will house a radiotherapy training center, demonstration rooms, and manufacturing and warehousing. This new facility is part of Varian's commitment to partner with the Brazil Ministry of Health to increase the access to and quality of radiotherapy treatment in the fight against cancer in Brazil and across Latin America. Once completed, this facility will serve as Varian's training and education center for all Latin American customers, in addition to manufacturing and servicing radiotherapy equipment. "With this new facility, Varian is making a long-term investment to advance the knowledge and access to advanced radiotherapy care in Brazil and across Latin America," said Humberto Izidoro, Varian's managing director in Brazil. "Once the facility is completed, we expect to be training hundreds of professionals a year on the use of radiotherapy equipment and treatment plans and techniques." Varian Medical Systems, Inc., of Palo Alto, California, focuses energy on saving lives by equipping the world with advanced technology for fighting cancer and for X-ray imaging. The company is the world's leading manufacturer of medical devices and software for treating cancer and other medical conditions with radiation. The company provides comprehensive solutions for radiotherapy, radiosurgery, proton therapy and brachytherapy. The company supplies informatics software for managing comprehensive cancer clinics, radiotherapy centers and medical oncology practices. Varian is also a premier supplier of X-ray imaging components, including tubes, digital detectors, cables and connectors as well as image processing software and workstations for use in medical and industrial settings, as well as for security and non-destructive testing. Varian Medical Systems employs approximately 7,400 people who are located at manufacturing sites in North America, Europe, and China and sales and support offices around the world. For more information, visit http://www.varian.com or follow us on Twitter.